Nov. 4, 2017 1:30 p.m.
From the viral #MeToo hashtag online to the streets of Vancouver, more than a hundred gathered outside the Vancouver Art Gallery Saturday to shed light on issues of sexual harassment and assault. 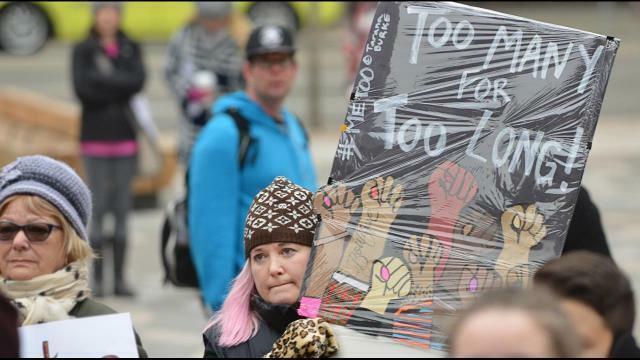 The MeToo rally, organized by March on Vancouver, was hosted in unity with other events happening throughout North America, including in Los Angeles and Toronto. On Oct. 30, thousands took to the streets of France for rallies looking to raise awareness and end sexual violence. Saturday’s rally brought the growing online movement to the steps of the art gallery, as local activists and sexual assault survivors shared their stories. “We are one, gathered here to say: me too,” Lewison said, adding that harassment and assault is not just a Hollywood issue, and one that does not discriminate. The rallies stem from the recent #MeToo hashtag campaign started by actress Alyssa Milano in the wake up sexual harassment and assault allegations to Harvey Weinstein.